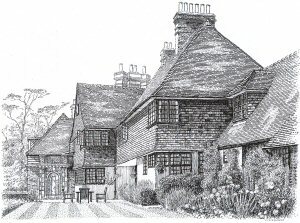 ACMS Society member John Fairbanks has kindly allowed us to reproduce some of his sketches of Arts and Crafts subjects in Surrey. Click on any of the pictures to see a larger version (opens in a new window). John shows here the view of the garden front of a house by Sir Edwin Lutyens in the Arts and Crafts style. The house was built in 1897 for Mr C Cook. The gardens were by Gertrude Jekyll. 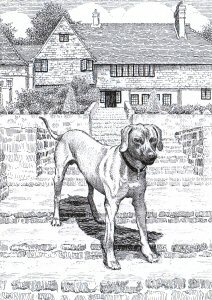 While sketching the house from the lower terraces, the owner's dog Hagrid came to keep an eye on proceedings and was duly recorded for posterity. 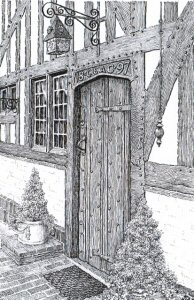 This sketch shows the main entrance door with the inscription on the lintel showing the date of construction and the clients' initials. The original bell pull can be clearly seen, too. John has produced many sketches on other topics, some of which have been used as illustrations in a book published in the USA.